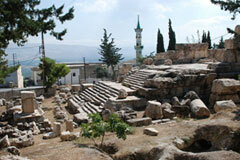 The Temples of the Beqaa Valley are a number of shrines and Roman temples that are dispersed around the Beqaa Valley in Lebanon. 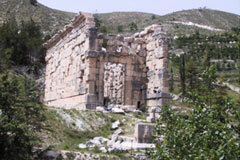 Documentation of the temples in the Beqaa Valley area began in the 19th century, with surveys by Edward Robinson in 1852 CE and Sir Charles Warren. The most notable of the temples of Venus, Bacchus and Jupiter at Baalbek were thoroughly studied by Paul Collart and Pierre Coupel. 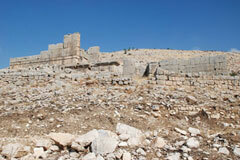 The typology of the temples has been studied and they are generally divided into Antae, Prostylos or Peripteral types. Antae temples have side walls that extend to form a porch at the front or rear (or both) and terminated in pilasters that were called the antae. 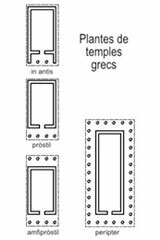 If columns were placed in advance of the walls or antae, the temple was termed Prostylos and if columns surrounded the temple it was termed Peripteral. The peripteral type is thought to be the most perfect form of temple and the best preserved of this type is that of Bacchus at Baalbek.